iFishAlaska Guide Service owner and guide Spencer Cook, is well respected among Deshka River fishing guides and he spends a majority of each summer guiding salmon fisherman on the Deshka. 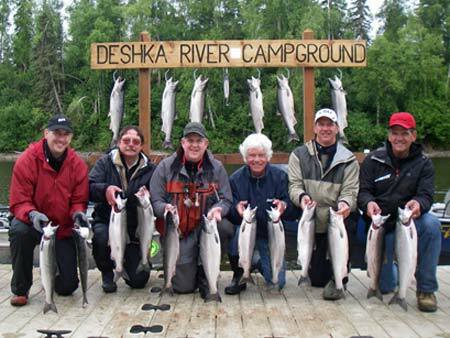 iFishAlaska Guide Service offers daily salmon fishing charters to the Deshka River, or Little Susitna River, or other tributaries of the Big Susitna River, which are some of south central Alaska’s hottest king salmon and silver salmon fisheries. We have daily salmon fishing trips launching from Deshka Landing, which is located approximately 90 minutes drive north of Anchorage. All of our Deshka River fishing guides are licensed and insured and have years of experience fishing the rivers we will take you. You are invited to ride with us into the “real Alaska” in one of our custom welded jet powered outboard river boats where you can experience world class Alaska salmon fishing and see sights that most visitors never get to see. Our Deshka River fishing guides know the river and have decades of experience fishing these waters. Ride with them in our jet powered river boat and go “off road”to see Alaska the way it was meant to be. Get away from the crowds and go with us for some Deshka River Fishing! We often get asked the question about whether someone needs previous fishing experience to go on one of our charters; the answer is NO! We love introducing folks to fishing and our guides will teach you what you need to know to catch Alaska salmon. We provide all the gear, we bait your hook, and we even clean your fish at the end of the charter. 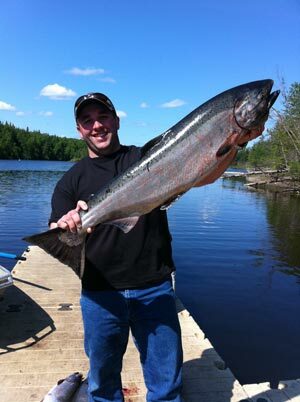 The Best Salmon Fishing Near Anchorage AK. 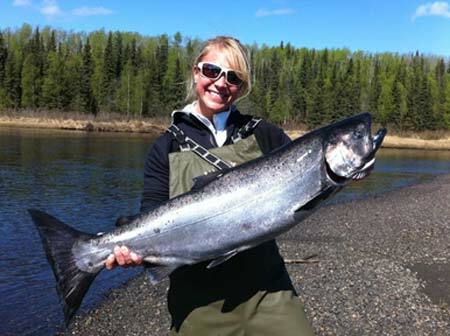 The Deshka river boasts one of the best king salmon and silver salmon run counts of any river in south central Alaska. The Alaska Department of Fish and Game operates a weir at mile 7 on the Deshka and each season they manually count all of the salmon that pass through it. The Department staffs the weir all summer and these crews keep close track of not only numbers, but run strength and the health of the fish, which helps to keep the Deshka open to fishing even when other local streams in the area have been closed or restricted. In recent years, this river has consistently produced strong enough salmon returns to remain open to fishing all season with few closures. We use custom welded jet powered boats that are made specifically suited for Deshka River Fishing and are perfect for running in very the shallow waters encountered. Often times we are skirting through shallows that are only several inches deep. Our custom welded riverboat was built locally by Greatland Welding and Machine and is perfect for the needs of our Deshka River Fishing Guides. This boat was designed with your comfort and safety in mind and makes an excellent fishing platform. Our boat is an open flat bottom design we like to call a “sled”. It’s very stable and easy to fish from.